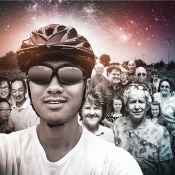 Zilong has been on the road for 22 months, in the company and often comfort of strangers. In this post he takes us through Europe as far as the Bosphorus and in acknowledging some truth in the stereotypes (we English can be a cold lot!) reminds us that brotherhood and sisterhood, kindness and compassion bridge all borders and soften all edges. 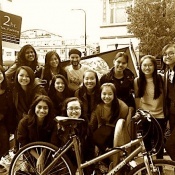 12 young women from Singapore and Mauritius meet Nipun and Pancho, learn about random acts of kindness, take the practice onto the chilly streets of Berkeley and watch the ripples of the warm hearts blurring the lines of separation and building bridges of compassion.